Property developer Renaker has agreed to buy the Trinity Islands site in Manchester site from Allied London. Allied London’s CEO, Michael Ingall, said: “Renaker have a proven track record as a residential developer and contractor in Manchester and are one of the few capable of developing the site and building high. I have every confidence that Renaker will make the project a huge success. Trinity Islands is a 1400 home residential-led development spread across 5 towers, and 150,000 sq ft of commercial space. 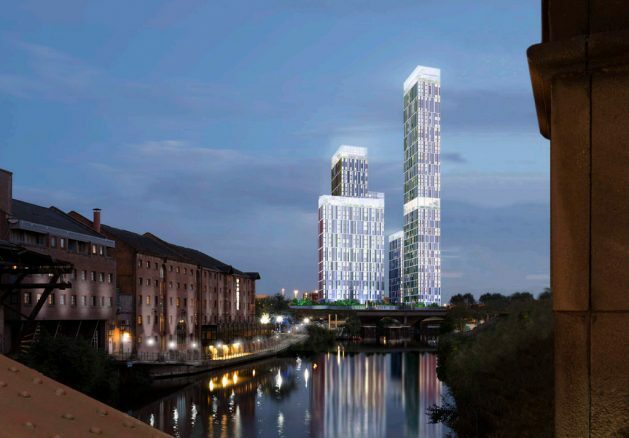 The tallest tower will rise 67 stories and will be the tallest building in Manchester. The gross development value of the whole site is approximately £1.3 billion.